Discovered in the 1960s, when the United States launched satellites into orbit to verify the Atmospheric Test Ban Treaty, gamma-ray bursts have continued to amaze and astound scientists for over 40 years. These titanic events, which emit more energy in a single blast than is emitted from our Sun in its entire lifetime, appear briefly and then are never seen again from the same location in the cosmos. Gamma-ray bursts (or GRBs) are the brightest astrophysical light sources observed today. Detectors on satellites orbiting the Earth detect an average of one GRB each day from somewhere in the Universe. 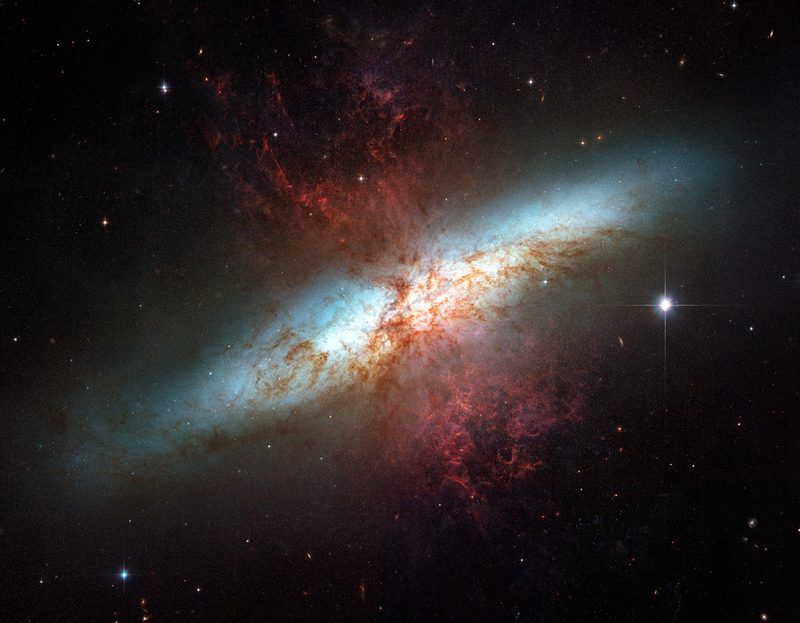 M82 lies 12 million light-years away in the constellation Ursa Major. Fermi’s LAT and the ground-based VERITAS observatory have detected diffuse gamma rays from the galaxy’s core, which produces stars at a rate ten times faster than our entire galaxy. Credit: NASA/ESA/Hubble Heritage Team (STScI/AURA). I am involved with two NASA satellite missions that are currently studying gamma-ray bursts: Swift and Fermi. Swift was launched in November, 2004, and has seen nearly 1000 gamma-ray bursts to date. It has a large field-of-view instrument, the Burst Alert Telescope (BAT) which watches about 1/6 of the sky at any given time. When a GRB is spotted with the BAT, Swift “swiftly” and autonomously repoints to center the GRB in the field of view of its narrow-view instruments, the X-Ray Telescope (XRT) and the Ultra-Violet Optical Telescope (UVOT). These instruments help to refine the position of the GRB, which is transmitted through the Gamma-ray Coordinates Network (GCN) to ground-based observers for additional follow up. For long bursts (those that are greater than 2 seconds in duration), afterglow emission from the cooling embers of the explosion is seen at longer wavelengths of light for days to months. And spectral analysis of this emission can yield distances to the galaxy in which the explosion occurred. Through studies of the afterglow emission, long GRBs have been identified with the detonation of massive stars in which the core collapses down to a black hole. Shortly after launch, Swift played an important role in identifying host galaxies for short bursts, which may be associated with the coalescence of two compact objects in a binary system, such as two neutron stars. For the short GRBs, not much debris is left in the system to emit afterglow, and it remains much more difficult to pin down their origins. In either case, however, there is considerable evidence that GRBs are signals that indicate the formation of black holes. NASA’s Fermi Gamma-ray Space Telescope has a set of 14 Gamma-ray Burst Monitor (GBM) detectors that provide all-sky coverage for a wide variety of celestial explosive events. Since launch in June 2008, the GBM has logged over 1700 GRBs, as well as thousands of Terrestrial Gamma-ray Flashes (TGFs), which have now been shown to be associated with thunderstorms on Earth. Fermi has also seen over 110 of the GBM bursts with its higher energy detector, the Large Area Telescope (LAT), as well as providing additional information on over 230 GRBs seen with Swift. As can be seen in the figure, there is no association between our galaxy (which is centered horizontally across the equator of the oval) and the locations of GRBs. Measurements of the distances to GRBs has indicated that most of them originate in galaxies that are billions of light years distant. Skymap of data from Fermi showing positions of 1722 Gamma-ray Bursts detected since launch in 2008. Credit: NASA/Fermi/GBM team/Valerie Connaughton. Gamma rays in the GRBs detected by the LAT have energies as high as 100 billion electron volts! This is more than a factor of 10,000 times the typical energies of photons in bursts detected by Swift and the Fermi GBM. 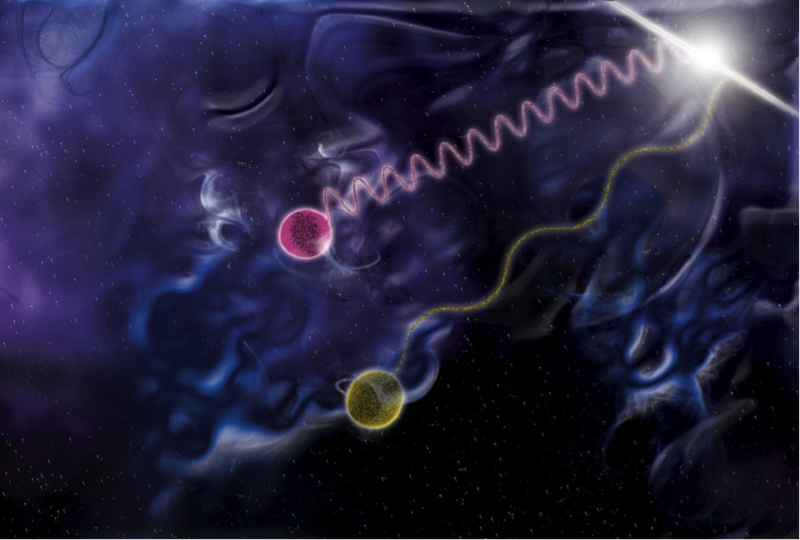 By detecting gamma rays over such a large range of energies, Fermi has been able to set interesting limits on the foaminess of spacetime, a property that is predicted by some theories of quantum gravity. In these theories, higher-energy photons should be slowed down by interacting with the quantum foam, whereas lower-energy photons should glide smoothly over the foam. This is rather like an ice skater with long, smooth blades gliding over the ice without noticing any imperfections. If you gave the ice skater blades with small ripples in them, progress would be impeded as the ripples caught on bumps in the ice. A short GRB studied by Fermi in 2009 indicated that two photons which differed by a factor of million in energy arrived at the satellite within 1 second of each other, after traveling for 7 billion years! This indicates that spacetime is smooth (as originally predicted by Einstein) and has eliminated many models for quantum gravity that predicted otherwise. Artist’s illustration of Two photons of different energy race through foamy spacetime after being emitted from a gamma-ray burst. Credit: NASA/Fermi/Sonoma State University/Aurore Simonnet. Lynn Cominsky is a Professor and Chair of the Department of Physics & Astronomy at Sonoma State University, in Rohnert Park California. She is a scientific co-investigator on NASA’s Swift and Fermi missions, and the lead for the Education and Public Outreach programs for both missions. She received her Ph. D. in Physics from MIT in 1981, and has spent her career studying the highest-energy phenomena in the Universe as observed by a wide variety of NASA X-ray and gamma-ray missions. 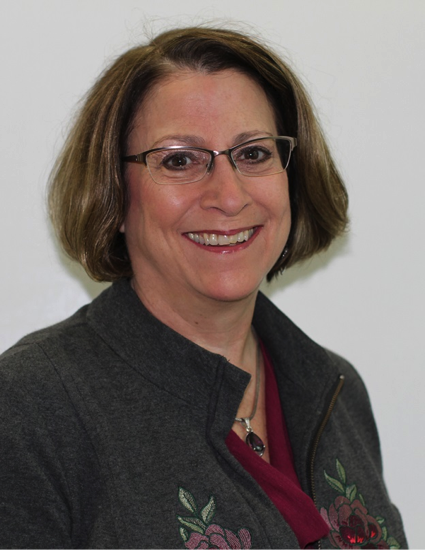 She is a Fellow of the American Physical Society and the American Association for the Advancement of Science, and was recently honored by the Women in Aerospace organization with the 2014 Aerospace Awareness award. ← Hunting the Higgs boson… with light!